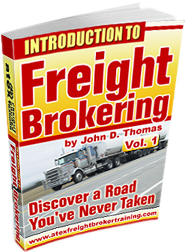 Ever thought “How to become a freight broker?” Stop thinking and act now! For some people, driving a truck is just ain’t their thing. Driving and all its tension and pressure can become very tiresome. If you are an employee in an office and you want to quit the nine-to-five schedule, it may be time for you become a freight broker. A freight broker, also called a truck broker, acts as a middleman between the customer and a carrier. They earn commissions for their valuable services. However, certain requirements have to be considered before becoming a freight broker. Personal skills and office set up are the prerequisites before you can actually begin operating as a truck broker. Another requirement that is relatively new is called the Unified Carrier Registration (UCR). The total costs on these registrations run about $1,400 to get started. For those applicants who make a deposit of $65K to $75K into the trust fund, the administrative fee is either zero or a very low cost. Your broker authority is issued through the Federal Motor Carrier Safety Administration (FMCSA) of the Dept of Transportation – there are no state licensing requirements.